Dartford Folk Club was delighted to receive congratulations from many wellwishers over the months that followed its 'moment of glory'! Listed below are a selection of the comments and responses folk made on hearing the news. "Very many congratulations from the other Kent folkies - Well done"
"Even more congratulations on winning the BBC award. You must deserve it. Well done. Here's to the next 35 years!!" "Just a congratulatory message from all of us at the Ram Club in Claygate on your success last night in bagging the BBC R2 Folk Club of the Year! Well done to everybody involved: and we hope you had an absolutely fab night out at The Brewery...........Continued success to one and all. Drop in if you're ever over our way." "How absolutely brilliant and no less than you deserve. We are always saying how lucky we are to have such a wonderful club to go to and its all thanks to you both"
"We've just heard the news.What a well deserved recognition for you both.Congratulations!!!!!" "Congratulations on being BBC's Folk Club of the Year. It's been a long time since I've been (1970s) and I live in York now, but it's great to hear it's still going strong." "Congratulations on winning best folk club at the BBC2 awards!" "Whilst I missed the transmission of the BBC Folk Awards very very many congratulations to you both ( and all the team who support you ) on winning the Folk Club of the Year award. As far as I am concerned you won the Folk Club of the 20th Century too. Well done and keep up the high standards of live music." "........A great achievement and it is about time. When we next see you the drinks are on us..........ALL THE VERY BEST"
"Congratulations! Will you still speak to us? See you on June 10"
".........we couldn't be more delighted and you two certainly deserve the recognition. Unfortunately we are out this evening but I'll have to try and learn how to use the BBC web site and listen tomorrow. Congratulations once again, really proud of you both"
"Hope this is one of many messages you receive! Congratulations on winning a much deserved and long ovedue award. So many of the performers have said it is the best organised , attended, and 'best' club. You cannot begin to imagine the amount of pleasure we have gained from coming to the Club this last 7yrs (and also way back at the railway in my teens dare I say!!). My only worry is in belonging to the best folk club in the world, drinking the best beer, will I be spoilt for anything else? You've set 'the' standard now for many years for others to try to emmulate!........Once again congratulations. "Wow that is an achievement! Congratulations and well deserved. Best wishes"
"Congratulations Pam & Alan on your award, very well deserved. Long may you run!!" 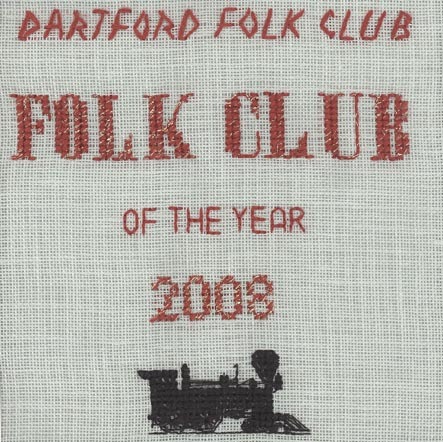 "Many congratulations on picking up the ‘Best Folk Club’ award. Thoroughly deserved!" "CONGRATULATIONS on your club's win!! Well done!" "At last at last a club gets it that I'm proud to be involved with. Not just comfortable but award winning too! Well done you lot........"
"Many congratulations, very well done and great to have recognition of all your hard work!.........." ".........and very well deserved too!!" "Wow, yipee, well done, you deserve it. This year the UK, next year the World." "I have just heard the news of your award at the Folk Awards and would like to pass on our congratulations to a well deserved winner. Please pass it on to all concerned." "CONGRATULATIONS !!!!! Well deserved and we are delighted for you"
"Congratulations! !............Well deserved - should have happened many years ago and several times in between!!" "How wonderful!!!!! Do give them my congratulations - it must have been a wonderful evening at DFC!" "That's great news!Thanks for telling us. Pam and Alan must be thrilled, as must you all be!Well done y'all!" "Well done to you all, what a lovely surprise it must have been. Will try and listen to the broadcast this evening." "Isn't this brilliant and not before time. Pam and Alan must be over the moon." "Thank you for letting us know of the award, what a lovely surprise and great honour. Hope it is put in the local paper." "Congratulations Pam and Alan. It is a long time coming." "Please pass on my hearty congratulations to Alan and Pam. I was in fact listening to the radio and thought I recognized the voice and then was delighted to hear it was Alan - very, very well deserved."